Native American mascots a concernTaylor spent a substantial amount of time discussing the public perception of Native Americans: the current logos and mascots depict how much of the illustration is pertinent to what Native Americans look like. “Public gaze and perception is what sets up power,” Taylor said. He added that Americans have become so accustomed to seeing Native American chiefs with feathered hats and elaborate costumes that they believe this is what their reservations look like. Taylor explained that on a typical day, Native Americans do not dress at reservations elaborately. “It has reached the point that a non-native can put on what Americans think is an authentic Native American costume and people will actually believe that the person wearing the costume is an actual native,” he said. Taylor shared a story about the former mascot of the University of Illinois, the Fighting Illini, to underscore his point about society’s perception of Native Americans. 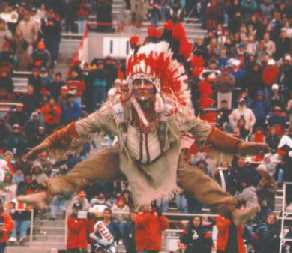 The NCAA started a policy in the fall of 2008, which prohibited collegiate teams from using Native American mascots. The University of Illinois mascot was mistaken for an actual Native American chief and was asked to perform weddings.Comment: For more on the subject, see How Mascots Foster Racism and The Problem with Chief Illiniwek. Below: "I do weddings and bar mitzvahs, but not birthday parties."